The M House is a three-story wooden urban residence that stands on an approximately 100 sqm plot of land. In this home, we attempt to reevaluate the traditional Japanese minka(house) as the most fitting interior space for a highly insulated house. One of the greatest features of the minka as we see it are first its unified interiors that can be partitioned off with sliding doors as necessary. In the superinsulated house, which will come to rely more on radiant heating and cooling systems as opposed to convectional systems, traditional interior spaces that are connected together are preferable as compared to interior spaces partitioned off by walls and doors. In M House, we designed rooms at slightly different floor heights that are both interconnected and assembled together in a three-dimensional fashion. The courtyard in our design, surrounded by walls, allows you to look up at the sky from within each room — this is also our reinterpretation of the tori-niwa(literally, “passage garden” or an earthen passage) in the traditional machiya(row house). All the rooms in the house open up to this courtyard. 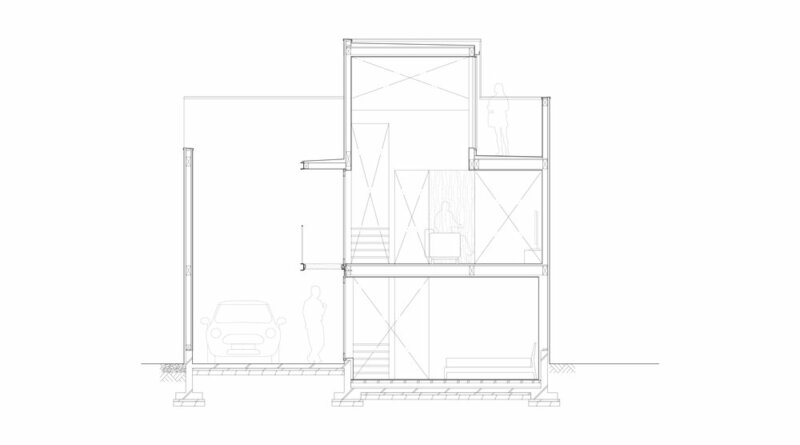 This design enables a sense of openness in the house while simultaneously ensuring the residents’ privacy, even in its densely packed neighborhood of homes. Contractor: ArchitectsTechnology Tokyo Co.,Ltd. + Ogawa Kensetsu Co.,Ltd.